I had a brief stint in the costume and scenery department for the theater while in college. I learned a few tricks with some power tools and a sewing machine. I cut some pieces of wood, painted some backdrops, and sewed very mediocre peasant attire. 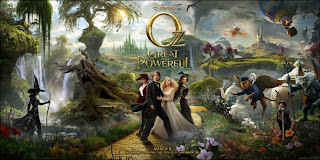 ...and be sure to see Oz The Great and Powerful in theaters March 2013.